There are currently 2 schools of thought on who this "restrainer", in other translations, is. The two candidates are the Archangel Michael or the Holy Spirit. There are quite a few verses dealing with the powers and roles of each. We will take a look at a few and see if they match up to the requirements of the restrainer in 2 Thessalonians. 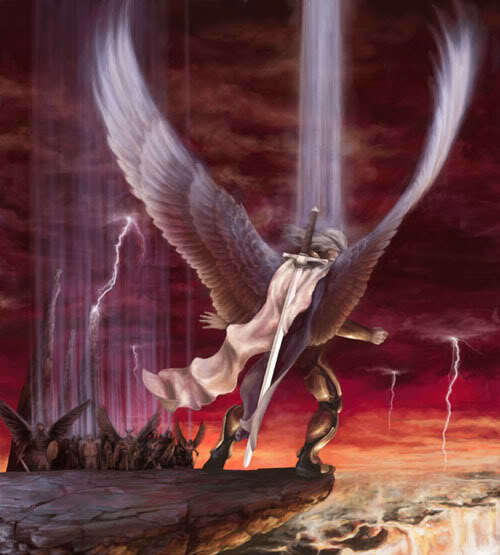 Out of the entire Bible the Archangel Michael only shows up a total of 5 times. He appears to be a tremendously powerful angel and is named as a chief prince and archangel strong enough to take on the likes of Satan. Also something interesting is that angels, asides from the Cherubim and Seraphim, do not have wings. So this depiction of angels with wings is not accurate. Satan is a Cherubim so he has a wings. Clearly Michael has his limits and is not powerful enough to hold back Satan on his own, as both Jude and Revelation prove. Also it would appear that Michael is specifically assigned to guard Daniel and his people, the Israelites. There are even more verses concerning the Holy Spirit. All of them confirm over and over again that the Holy Spirit is the 3rd part of the Godhead. As such he shares all the powers and abilities of God. God is omnipotent, omnipresent, and all knowing. As we know Jesus, when being tempted by the devil, was able to tell Satan to depart and Satan had to immediately leave Him. Jesus was also was viewed with dread by evil spirits and demons wherever he went, for he was able to cast them out by simply telling them to leave. Likewise the Holy Spirit shares that power and can easily hold Satan and all his angels at a standstill, or if necessary throw them out. It is my contention that Rev 12:7-9's throwing out of Satan from heaven was not because of Michael and his angel's efforts, but rather the interference of the Holy Spirit. Well where was the Holy Spirit before this? 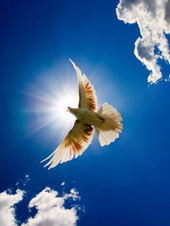 We know that every Christian receives the Holy Spirit upon accepting Jesus as Lord and Saviour. We also know that he resides in all true believers, sealing us until the day Jesus comes to receive us to Him. Could it be a coincidence that Paul in 2 Thes 2:1-10 mentions that our catching up to Jesus coincides the removal of the restrainer and that the AntiChrist is to appear immediately after? So lets compare the qualities of the restrainer and see which candidate meets them all. The restrainer is referred to using both the neuter and masculine genders. The restrainer existed and was actively restraining in Paul's day, as well as throughout subsequent human history (until a future time when he will be "taken out of the way"). The restrainer has the authority to dictate, control, and direct the events of human history. The restrainer is powerful enough to hold back mighty spiritual forces, including the most powerful created spirit being (Satan -- see 2 Th 2:9). The restrainer holds back lawlessness everywhere at once on a global scale. The restrainer must maintain the highest standards of godliness and holiness in restraining the spirit of lawlessness during this time period. As you can see Archangel Michael, who is powerful in his own right, already has problems when it comes to dictating human history and restraining upon a global scale. But most important, it is not even known for certain that he could hold back Satan himself. In Daniel 10:20-21 Michael and the messenger angel was needed to fight the Prince of Persia. Then in Jude, Michael must defer to God to rebuke Satan, indicating that his power alone is not enough against Satan. So the more safe bet for the restrainer is the Holy Spirit, the 3rd person in the Trinity that makes up God (YWH). He not only seals us but protects us, as true believers.